Christmas Giveaway Winner and Merry Christmas to all! I had no hard time illustrating my clients, really, no joke, from the depth or my heart, it IS easy. Because they are all beautiful! When one mom asked me to illustrate her baby daughter, I went "wow, we have a baby product commercial actor right here". Another time a couple asked for a wedding illustration and I went, "good Lord, what is this? Disney Prince and Princess?" And believe me I'm not kissing up their *** right here. It is just, coincidentally always, the good looking people happened to be my clients. 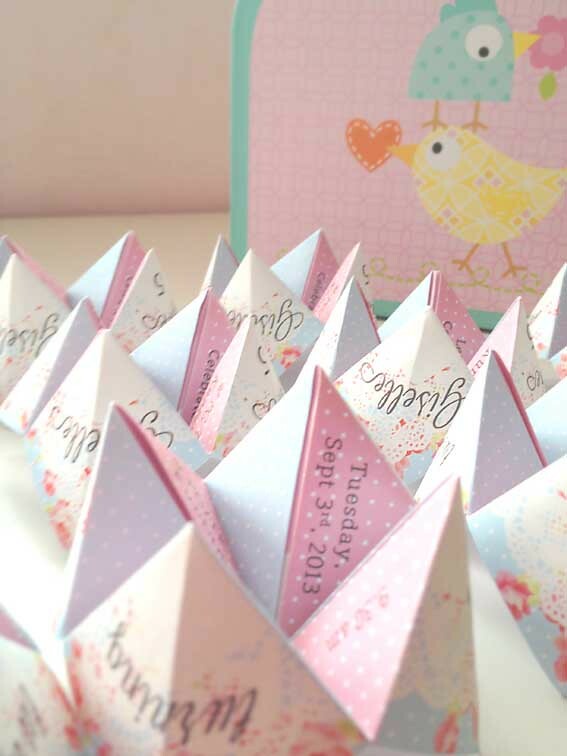 And I can't believe my giveaway winner is so painstakingly perfect as well! 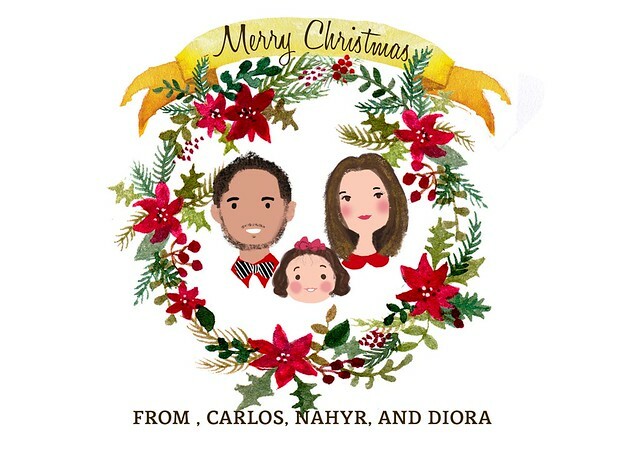 I can't share Nahyr's own pictures that I use as a reference, but here is my illustrated version of Nahyr and her family. I tell you that my illustration really didn't do justice to their real life beauty, especially her daughter! To those who didn't win, fret not, don't give up. I have more giveaways coming up, either a product from me or a third party, I can assure you the giveaway will rock. So anyaway, all and all, I hope you have had a really good year, and here's to looking forward to a brighter brand new year, and of course, a Merry Christmas. See you next year! Falalala lalala. 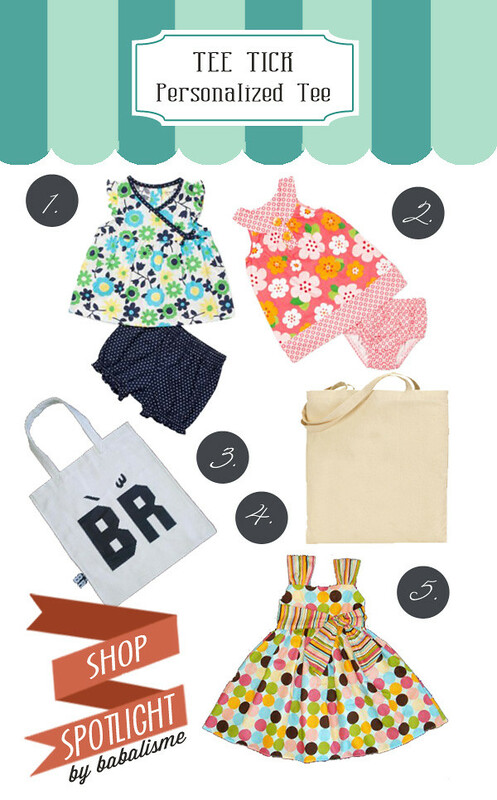 As I announced yesterday, here are babalisme's Christmas *rather flash* giveaway! I have also gave you the lengthy chit chatty type of giveaway intro yesterday, so now we can go through all the technical stuffs about the giveaway! Read on! The winner may print as many as she/he like for as many Christmases as he/she desire, but please use for PERSONAL USE only. If in any way the design gives you any direct or indirect monetarial advantage, it is considered a violation to my rights as the creator and will be prosecuted. Open worldwide, everyone can enter! It will run from now, through Dec 21st, 2013 at GMT 5.00 or Dec 20th, 2013 at PST 21.00. I'm using rafflecopter so all your tasks are easily done and of course, checked! No tricks! 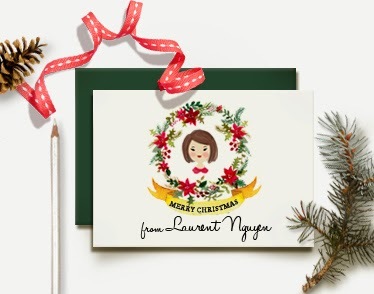 Christmas Giveaway : Mark your place! I have been taking Christmas orders since October, so, yes, carols are blasting from around Halloween in my home to get my spirit and inspiration in tune with the theme. I heard lots of people complaining when they hear Christmas related songs in public places on November, but hey, some of us need the spirit! So, yes, I have been all about Christmas. This year, I have been thinking of sharing the joy with a giveaway. I usually have a limited quantity of maximum personalized orders I set for myself per month, after all I'm still doing this gig one by one, on my own. For special times like Christmas the maximum bar is upped for a bit. Fortunately for you guys, this year, we have some numbers left! I might set the number a bit higher on purpose because I really do want a giveaway, or some printable might be accidentally left out by a runaway client (hint: oh, please don't ever, EVER, do this), but either way, the odd is in your favor. So, please, bookmark the blog, I'll be announcing the giveaway real soon. I'm still making all these happened and preparing all the stuffs needed. See you *ehem* tomorrow! Save your seat! Have I ever told you about my obsession wih wedding? I had mine once but that would never stop me on flipping through wedding magazines. I'm particularly blown away by the decoration and the whole themed party thing mostly, just as much as I love birthdays. Those partying goodness is not the only one that picks up my interest though, I love all the small details even before the wedding take place. I watch countless YouTube videos about amazing proposals. Kudos to all those creative people. Did you ever wondered what started the whole down in one knee with a diamond ring in hand started out? I stumble upon this great info graphic about diamonds in wedding, as a visual person it really does help satisfy my curiosity. Anyway, ehem, Rihanna you are probably wrong, diamonds don't shine, they reflect. 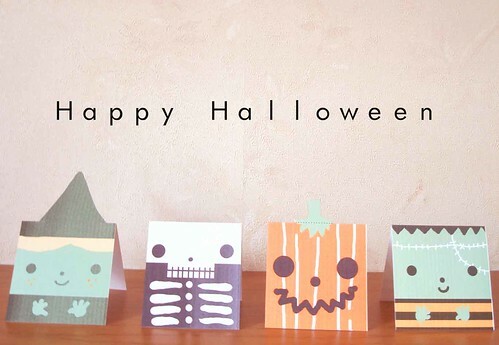 Make all the costumes, shop all the candies and chocolates, tell all the scary stories, and watched all the horror movies!! This is Halloween!! 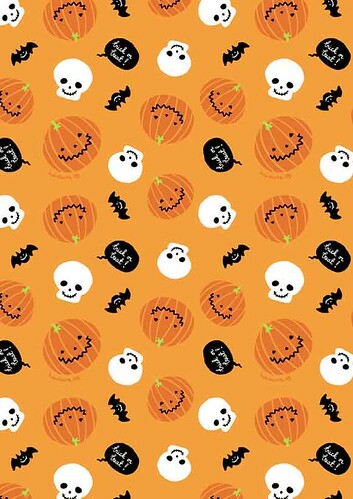 What is your favorite thing about Halloween? What would you be this year? I mean, I know I'm no match to Heidi Klum or The Harris-Burtkas on celebrating and dressing up for Halloween, but I do share a great amount of excitement about this particular holiday! 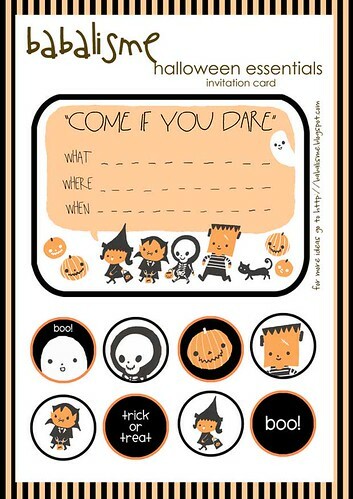 So, yes, share your Halloween stories, traditions, or plans with me. I'm wagging my tail (if I had one) to hear your comments! 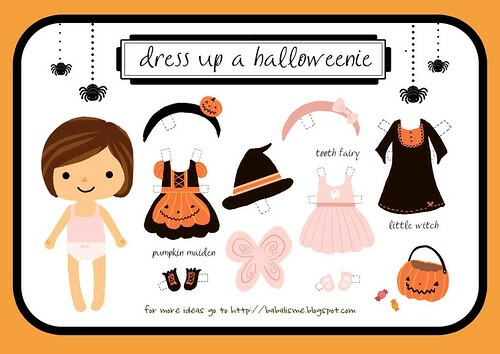 While you're thinking about your favorite things about Halloween, here are an array of Halloween fun stuffs at babalisme you can download for free! Let the download while you type! Yes you go, you multitasking diva! 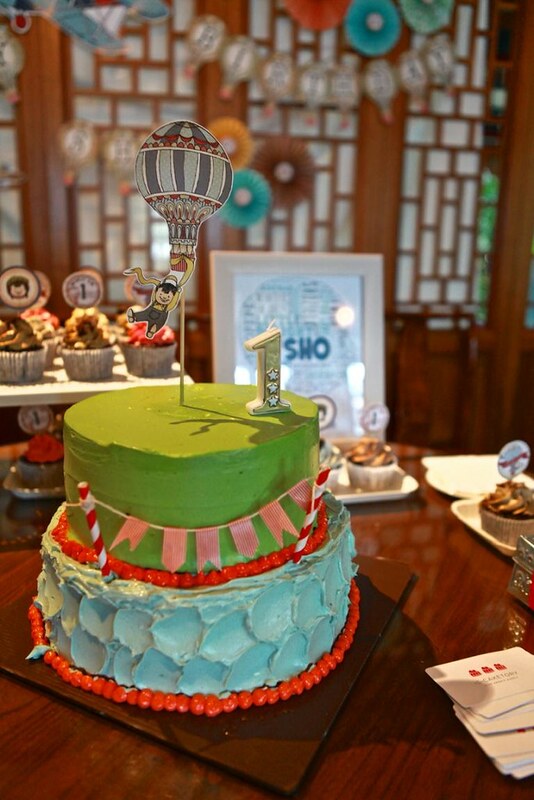 I was taken aback, when a client asked me to do a special party for her lovely and lively 1 year old, because his name is, Sho. It's such a wonderful name, I was tremendously inspired with the 3 letter name. I also find out it's not a nick name, it's a given name. Sho's mom was initially requested something to match the venue's peranakan nature; both menu and in-house decor. We later on discussed how peranakan theme can be both too mature and girly for a one year old boy. I suggested a theme, how about a vintage airplane and all things air transportation theme? The vintage theme suits nicely to the venue's decor and the airplane suits Sho's personality. I was again surprised when Sho's mom told me, the meaning of Sho's name (which, 100% I didn't know or had googled at that time) ..... Sho means "to soar or to fly". You know how great a coincidence occurs, you just feel it coming but then again still shocked to the bone when it actually happened. 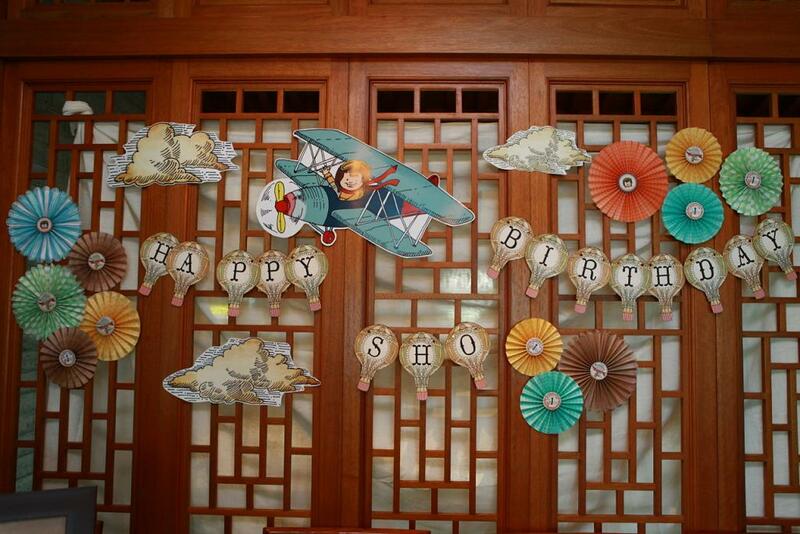 I had the feeling that Sho's birthday would fit nicely to a vintage aviation theme, but I nearly pooped myself (in happiness and bewilderment) when I learned about the meaning of his name. Maybe Sho's destined to soar the sky someday! It's been destined by my lousy 6th sense! :D It must be a boring story for some of you but, yes, it's really amazing for me. It's my first time suggesting a theme that fit the birthday boy's name like a glove! It's easy to arrange an "under the sea" theme for a girl named Ariel, but c'mon, how often you heard the name "Sho" and luckily guessed its meaning. I'm still dancing with joy right now. Seeeewww, my constant blabbering aside, about the party. It was wonderfully strategically arranged by Sho's mom. You can see all her talent right here right now. The theme is all things air transportation, or aviation, and it's vintage-y to blend with the venue. I love how all the things seem to fall perfectly into place. The boy with the wonderful name is literally active and a bit cheeky (in his mom's own words) in real life. So a portrait of him smiling, riding an airplane, hanging on an air balloon, or just simply being him is everywhere. A nice customization of the party, of course, but for me, it's all about Sho's character. The boy was full of it, we don't need any other cartoon character to stand in his place for his own first big day. 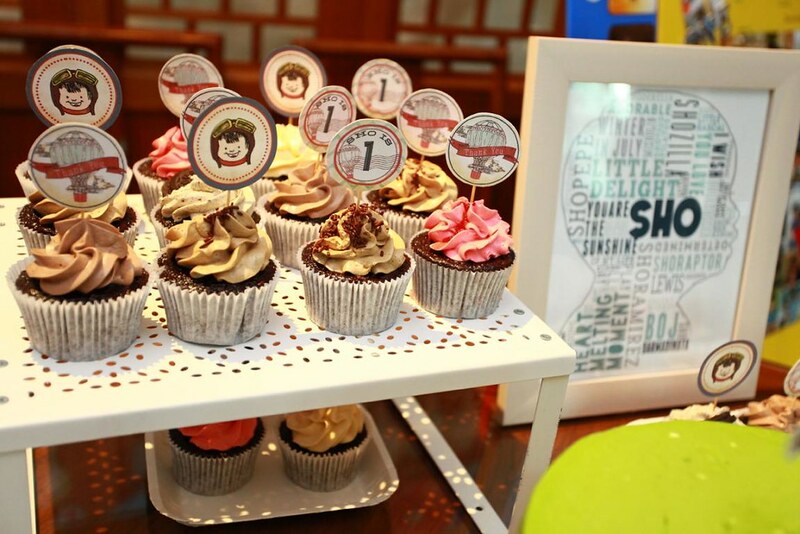 Do you like Sho's birthday party? Tell me what you think! Though I already had my wedding years ago, I refuse to let my wedding obsession runs off. I guess I'm just into pretty things -or- before you judge as a shallow and impossible fairy tale pursuer, I also think my years spent designing wedding related stationery gets into my head as well. So, yeah, I love wedding. There is one particular theme, one I almost wish-I-had-that all the time. 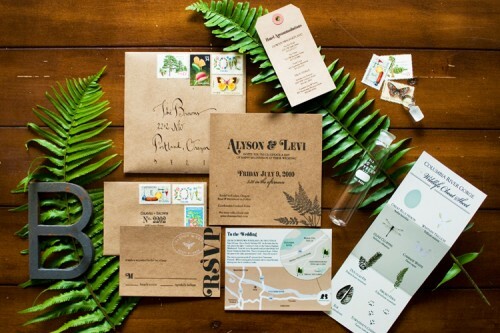 And it's a woodland theme for a wedding. It's never been the most popular wedding theme, especially here in Indonesia. Let me explain some things about weddings in Indonesia and maybe, some of other similar Asian cultures, weddings tend to must be huge, and lavish, and glamorous! Wear as much gold as you can, if it's not glitter-y safe it for another occasion! I think it's our tradition, did you know that one of Indonesian's traditional wedding dresses includes a 3 kilos worth of a golden head dress? And by infusing something, natural, something green or earth-toned, something woodland-ish, considered to be a taboo right here. Duh, obviously. 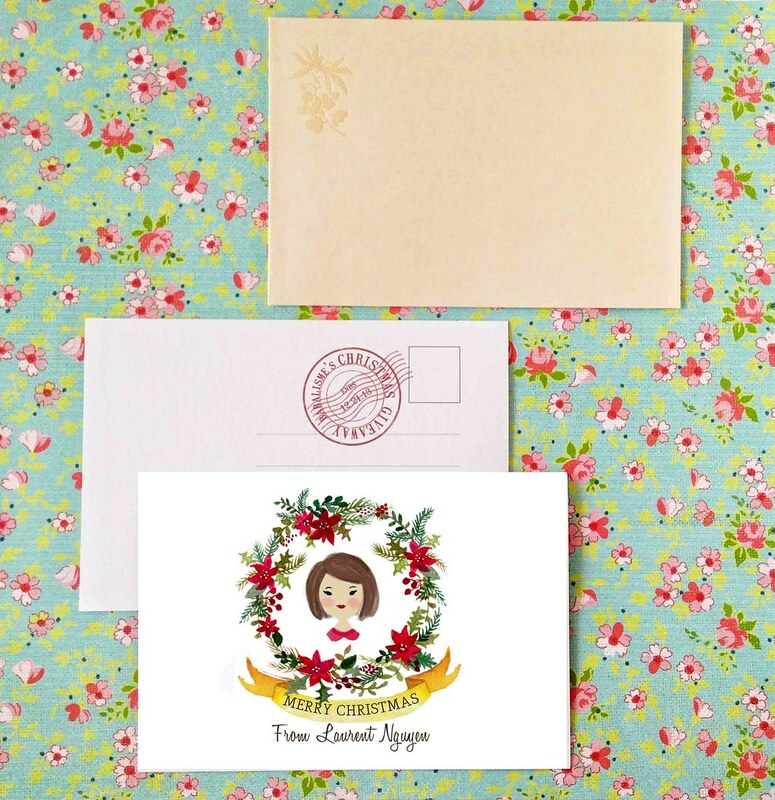 These stationery from Postal Press found via ohsobeautifulpaper is beyond charming. Preston Bailey's magic at work. See the full blown detail at VanityFair. But I see more and more nature inspired wedding these days, yes, even in Indonesia! In a wedding world, you might remembered the theme topped by Sean Parker's Vanity Fair covered millions dollar wedding. The bride wore Marchessa and Preston Bailey (who else?) decorated what's already a beautiful nature given venue into a more ethereal, out of this world place. And do I spy a rabbit on Olivia Munn's (one of the celebrity guest) lap? Is that the wedding favor? Ehem, ok, so celebrity always sets a trend, whether you like or not. Apart for Parker's wedding controversy, I still think it's a pretty theme to explore, and you can attain it with whatever budget you already have in hand. Ok, enough with the talk,.. without further ado.. if you're more into succulents than gold ornaments, I present you the woodland wedding inspirations. I hope you're enjoying them! Anyway, is the rabbits as wedding favor cute or over the top (would our venue and guests' dresses be covered with rabbits' poo?, discuss! I really really in full support of anything to get my 5 year olds off the screens (TV, Ipads, computers, handheld game consoles, etc). But then I maybe the one to blame since I'm ON screen most of the dayswhether it's replying emails or even trying to clear all those damn jellies (for those of you who is lucky enough to avoid the addiction and wondering what I'm talking about, it's a saccarine filled app game. Google for "candy" and "app". You'll see what I mean.) Guilty as well for bribing Big Sis G with a screen when she won't let me do my work, or when I'm driving, or when I try to chew my lunch. OK. There you go. My confessions of a tech addict mom. So, how do you have a screen-free day, you say? You might remember WikkiStix from this post. Those sticky yarn thingy is a great great screen distraction. Those little tiny fingers might kept busy for a while longer. And the good news..... For my fellow Indonesian readers, you and your children can actually test drive the product, for free, >ehem< , FREE !!! ... as in no charge at all, this Saturday, September 28th 2013 at Kinokuniya, Plaza Senayan. The workshop starts at 2 pm and only last for an hour, so, yes, don't be late at all! Find or ask Kinokuniya staff for the event corner, yep, if you find Kinokuniya is too vast for you. There will also most certainly a huge Wikki Stix promotion, extra gift with purchase and all! Ps. Since I live 2 hours drive from Jakarta (boooo!) I won't be attending the workshop myself, so if you please please please share with me your experience with WikkiStix to me! Any photos, tweets, FB updates or a sweet email would be fine! Tag me @babalisme! Well. I assume you're expecting this one's coming, ...another birthday for Big Sis G! Yay! So, yes, I made not one but two, TWO, Despicable Me inspired pinatas. One is minion shaped and the other take the shape of Fluffly the unicorn doll (or papoy, according to the minions).We'll get to these pinatas in later posts. Now, I'd like to show you how your 5 year old toddler can to be tricked into your own aesthetic, without him/her throwing a tantrum. 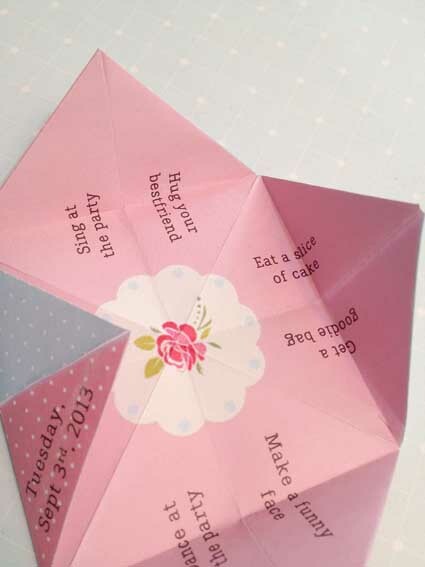 My secret is ..... incorporate my love of a British tea party theme into a cootie catcher! 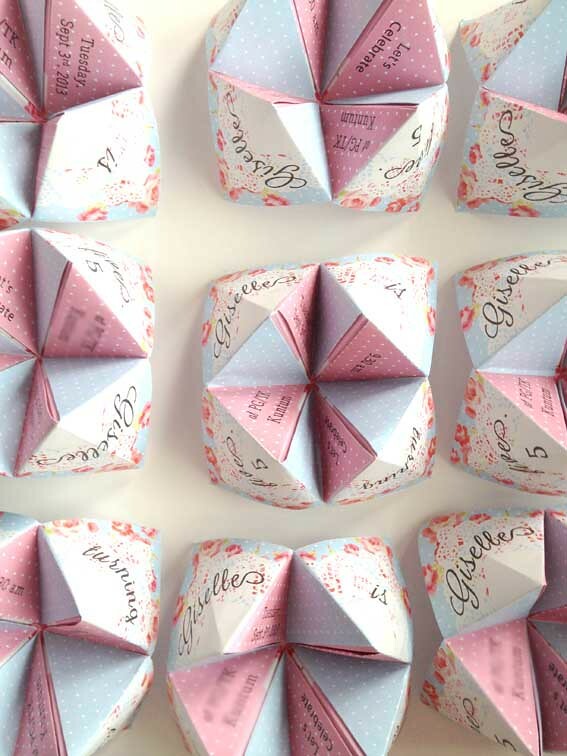 Kids love cootie catcher! And I love English roses! It's a win-win solution for us! How is it related to the minions, you ask? Who cares? Just kidding. 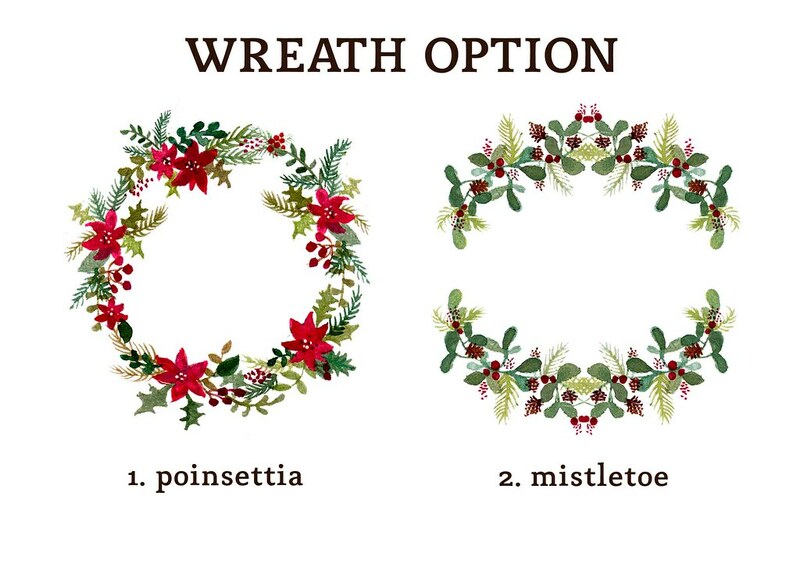 We're not having a full blown theme party, so I guess I can go away with mismatched party printables this year. Do forgive me. 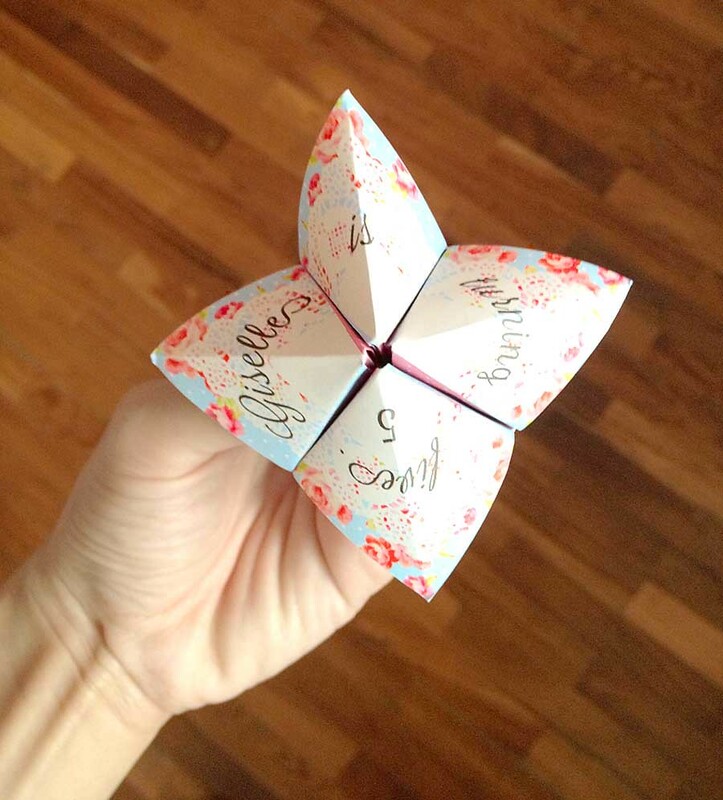 About the cootie catcher, just in case you're not really familiar with the name, it's a pretty simple origami kids make to predict future/fortune. Depending on what's written inside, of course. It's pretty popular on the playground of first or second grader. To play the game, one must hold the four corners with both pointer fingers and thumbs. Move it open and close, and pick two numbers (or symbols, or drawings, anything), and boom, your fortune's been told! 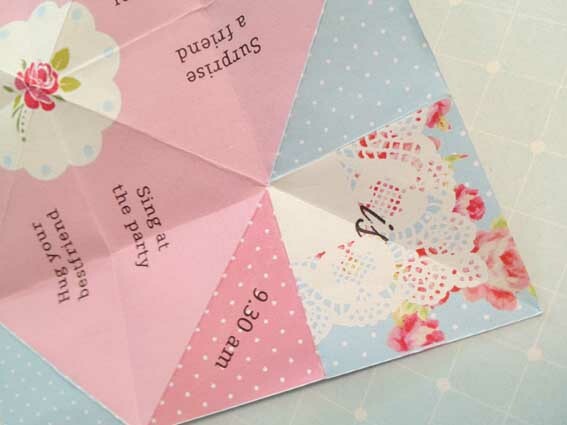 Since the cootie catcher is modified to an invitation, mine is filled not with fortune but lots of party's details, all the when and where and in place of the "fortune", I put lots of happy activity to be done when the player choose a certain number combination. Yes, I do think all babies are royals in the eyes of their proud parents, now, don't they. 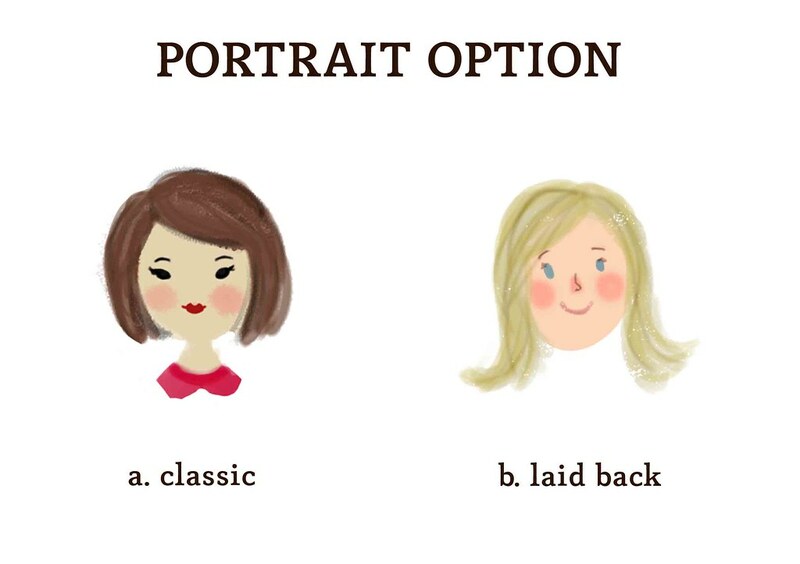 And what pinterest album would you create first do if you know you're expecting? ..Yes, I'm guilty as charged as well, it must be the "NURSERY" album, no? We can dream, right? pssh. Well, at least, if you're more than willing to turn your pinterest nursery album into reality, I have the one that would sure to help you. Meet Petitblue! This particular crib has a smart storage solution of a drawer underneath with soft closing system. Here is their intro for you to get to know them better..
"Petitbleu is an Indonesian brand developed by parents Celestine Yoviana and Dan Fulga. 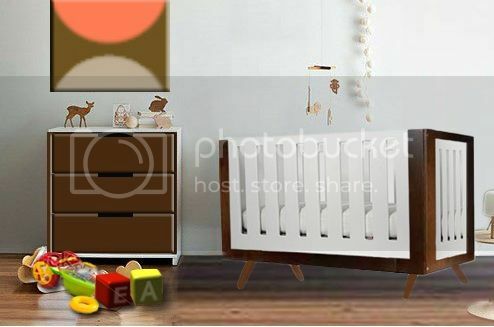 An Indonesian/Romanian, husband and wife team who realize the lack in nursery furniture to suit their taste while searching for a crib for their first son. All Petitbleu products are eco friendly with non-toxic finishes and made from timbers grown on renewable plantations. Each product is made to meet or exceed International safety standards. So there is no need to worry about baby getting “stuck” between the slats. 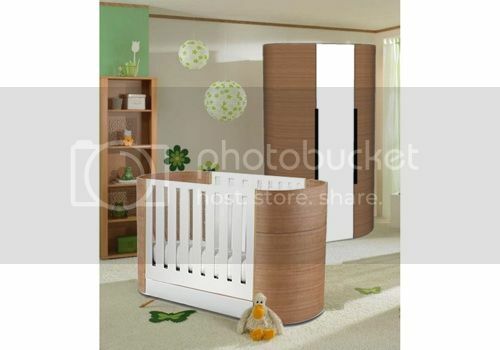 The cribs offers 3 mattress position for your growing child, and also converts into a junior bed. 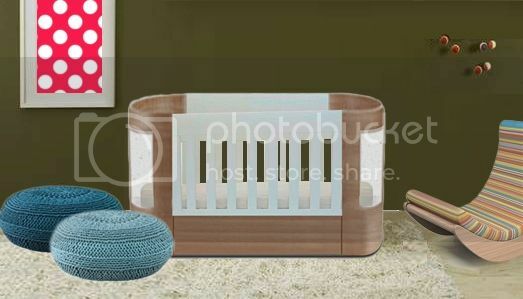 Petitbleu also offer very reasonably priced for the cribs that turn into junior beds. If you are already interested in buying something from them but the color or the size just don’t fit in your nursery, no worries because all of Petitbleu nursery furniture is custom-built exclusively for your bub and they ship to almost anywhere in the world." If you happened to stop by at Jakarta next November, please do jot in your reminder about the 5th Indonesia’s largest Maternity Baby & Kids expo, happening November 22-24, 2013 at Jakarta Convention Center (JCC). Petitbleu will be participating on booth #74, so if you are thrilled to see their products in real life, this is your opportunity to see them! And just saying hi would probably more than nice, remember, it's their first time exhibiting their furniture and wall decor, so don't be shy, just drop them a hello. 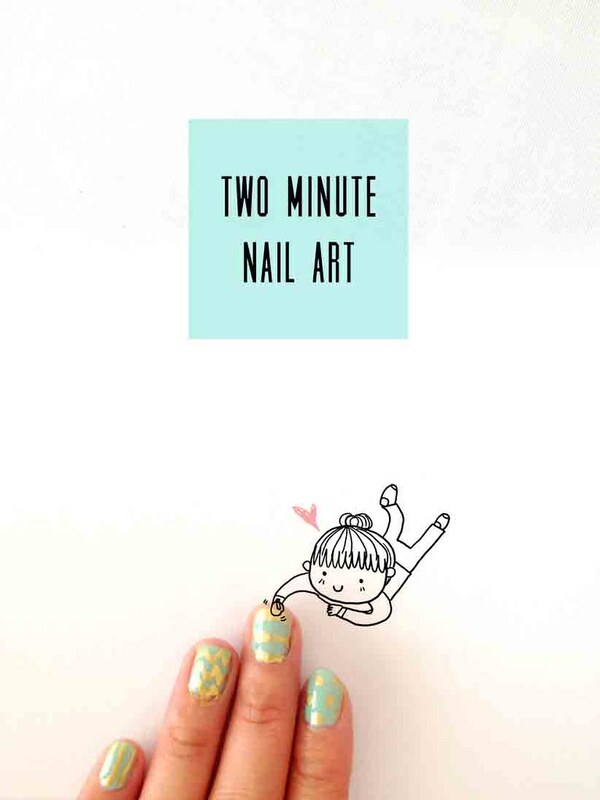 Unless you've been living under a rock (..or away from Pinterest and beauty blogs, that is), at some point of your idle time you must have considered doing your own nail art. I too have a whole Pinterest board dedicated to that, ehem, obviously. But as much as I'm good with paint, on paper, I have less luck when it comes to paint (polish?) on nails. Every time I look at those pretty nail art, the "ain't nobody got time fo that" meme lady came to my mind. 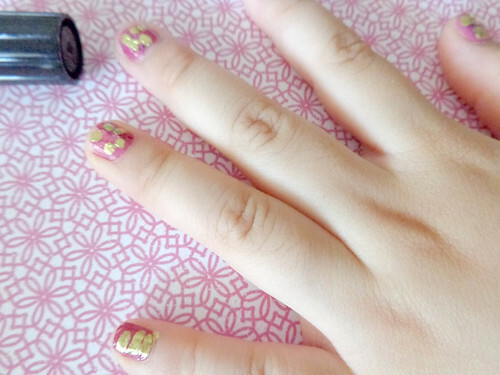 Not to mention on how pricey DIY nail art can be. 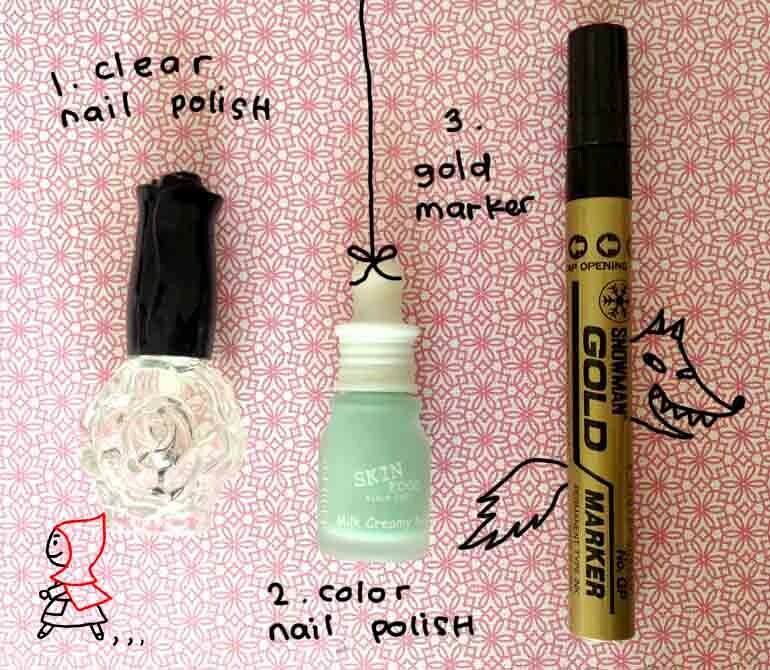 So here I am, presenting to you, the much obvious DIY, "Duh"-it-yourself, affordable, very quick version of the lovely nail art revolution. Forget scotch tape (because, heaven lord, who has time to actually wait your polish to be dried, scotch tape a stripe pattern, and wait for another good 20 minutes to see results? cue meme lady ..). Look I don't even need to put a step by step photos for you, do I? 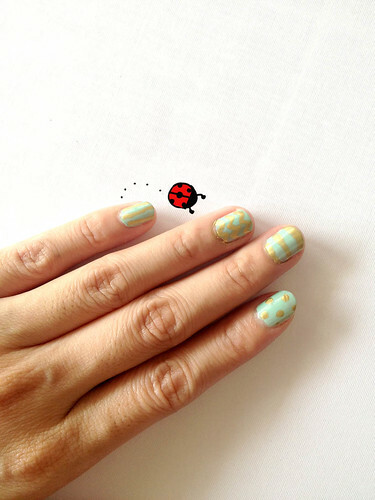 So, do you have any ideas or plans for summer nails? Remember when you're in a team, and you'll always have to make a "team" matching t-shirts for everyone in the team? I used to be that one person assigned with that job. I don't know, maybe they trust me because of t-shirt designing ability? Little did they know, designing and actually making one are on a whole lot different levels. And finding the one shop that can deliver what you design, obviously on a budget is pretty challenging. Ok, luckily that was about 10 years ago. Now, with a click of mouse you'll get thousands of shops to choose from and they will be willing to deliver the finished t-shirts right in your doorstep. Convenience! Yes! Now, I'm not guiding you to ALL the shops, but here's one that you should try if you need any clothing, not only t-shirt, customized. Meet Tee Tick! Now a bit about the shop ..
"TeeTick is a private label clothing manufacturer where its customers can order their own personalized clothing for personal use, group/team use, or for their clothing brand at affordable prices. Founded in Vietnam by a group of four creative, experienced and ambitious people who are passionate and strive for meeting the demand and the expectations of customers by creating quality personalized clothing "made in Vietnam", TeeTick offers printed and embroidered personalized t-shirts, poloshirts, sweatshirts, tank tops, hoodies, and jogging bottoms for men, women, and children. The company allows its customers to personalize their clothing with their own logos and text so that each item uniquely meets each customer's specific requirements. Being based in Vietnam allows TeeTick to offer amazing wholesale rates for the very affordable and great quality personalized clothing. Also, due to their positive trade status with the USA and E.U, the regulations for importing clothes from Vietnam are more agreeable. As a result, these competitive advantages make TeeTick become the “supplier of choice” for any clothing brands in the United States, Australia, UK and the rest of Europe. They bring together skills in sourcing fabric, sewing, printing, embroidery, labeling to ensure the clothing they manufacture helps their clients’ clothing to stand out from the crowd. TeeTick will only offer you the best quality personalized clothes at the most cost efficient rates. That is a guarantee!" all pictures taken from TeeTick's Facebook page, custom children clothings and printed bag divisions. Had they said they're not making T-shirt? They're doing custom dresses, printed bags, jeans, pants, hats, .. almost any items of clothing you'd need! 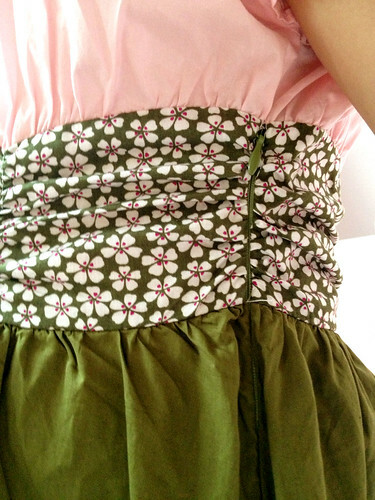 They are a basically clothing manufacturer who accept your personal orders. 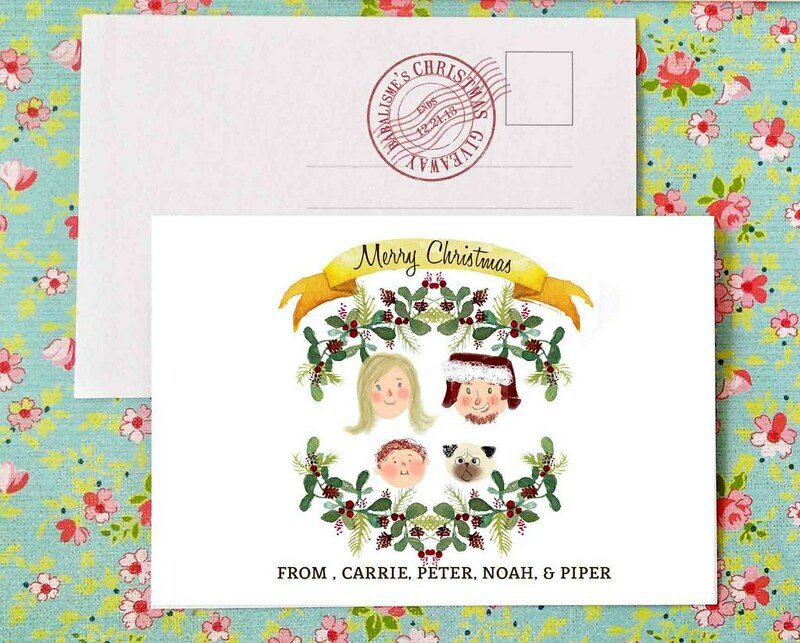 And they offer not only printing, but also embroidery to adding embellishments! I'm mostly intrigued about their children and maternity line. You know how lovable that maternity t-shirt that said 1 month, 2 months, ... or about a gender reveal, or maybe the one with a cute little foot prints on them? (They're all over pinterest, search them if you must) Now, that's only one idea from me to contact TeeTick immediately and order some personalized tee. What' s your idea for a customized clothing? Ps. TeeTick ships worldwide and have shipped to USA, UK, Australia, Canada, France. 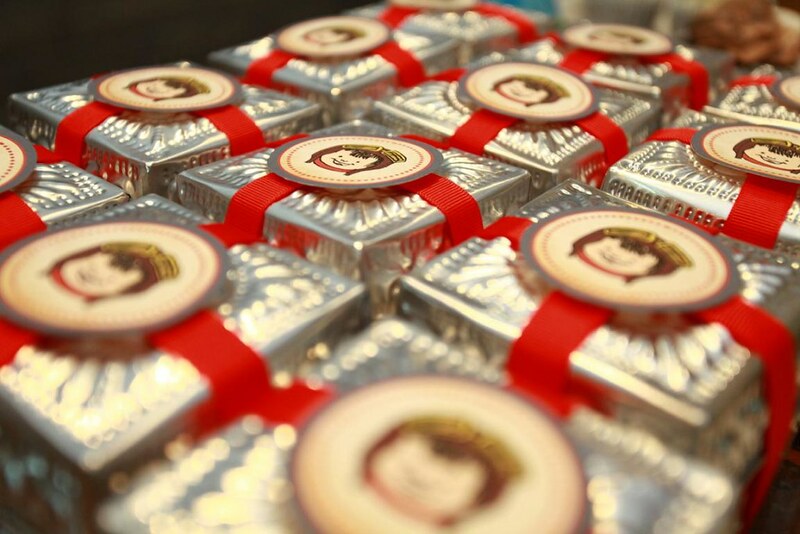 The shipping cost is approximately US$6.00 - US$7.00 per kilogram. If you have a toddler or two in your household, or have been babysitting one, you'll notice that you would likely to must constantly keep them busy. Otherwise, certain catastrophe might ensue. Occasionally might or might not accompanied with tears. 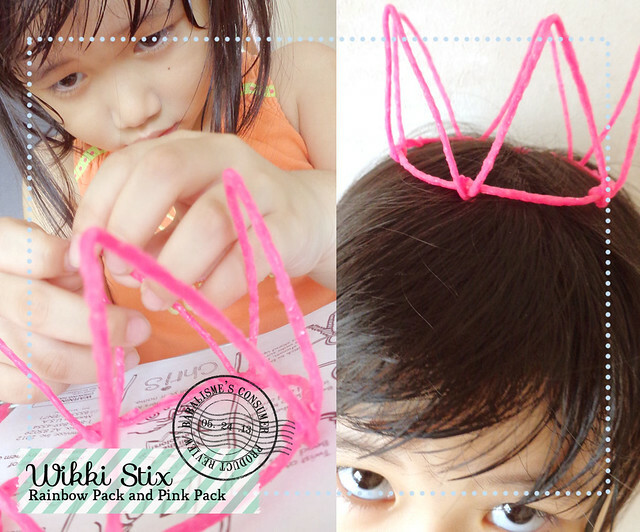 I'm so thrilled when Adeline Woo, a mom-treprenuer (mom "slash" entrepreneur) from Singapore introduce me to Wikki Stix! What? Yes, Wikki Stix. It's yarn pieces dipped in a safe food grade wax, basicaly, it's a bendable gummy sticks, much like a modeling compound, but skinnier. Younger kids might be mistaking it for a stick bubble gum, so please follow the age requirement and always assist your child when playing. Though it's food grade I don't think it's intended to be eaten. 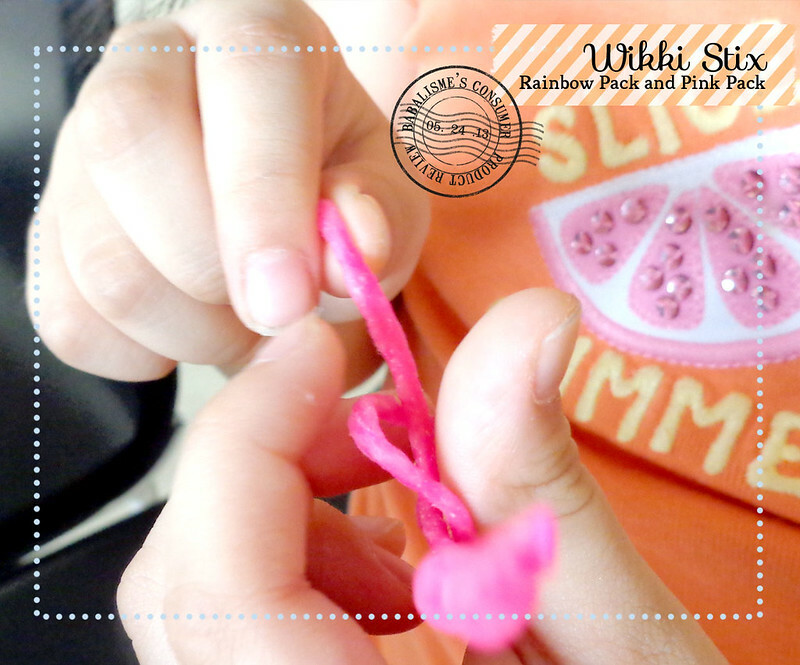 Wikki Stix 100% made in USA, so you can count on it by the safety dept. It's also gluten free, by the way, so kids with allergies can safely play with it. Still, I'd say it again, please don't eat it. I have to say I'm surprise that Wikki Stix is absolutely odor-less. It looks like wax, felt like wax, strangely doesn't smelt like one. But it does leave sticky feeling on your hands and on glass-y surface. Nonetheless, it's not messier than regular play dough and definitely more hassle-free. 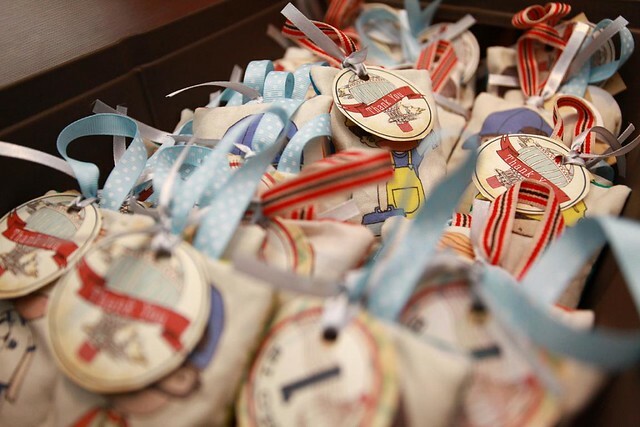 It also came in lots of educational activities, if you bought the intended packages. 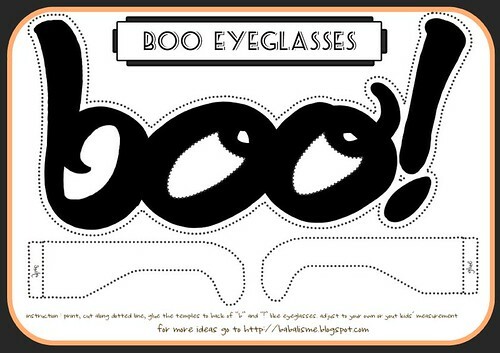 There are dot to dot activity, maze, numbers, alphabet writing, Chinese writing, and themed/seasonal activity kits. 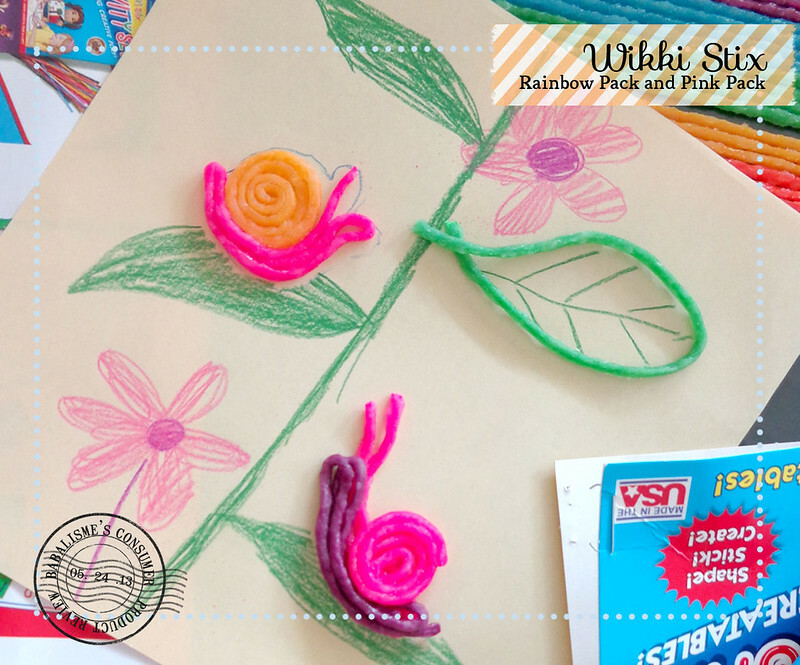 If you're doing an art and craft party Wikki Stix would be a perfect addition to your activity. 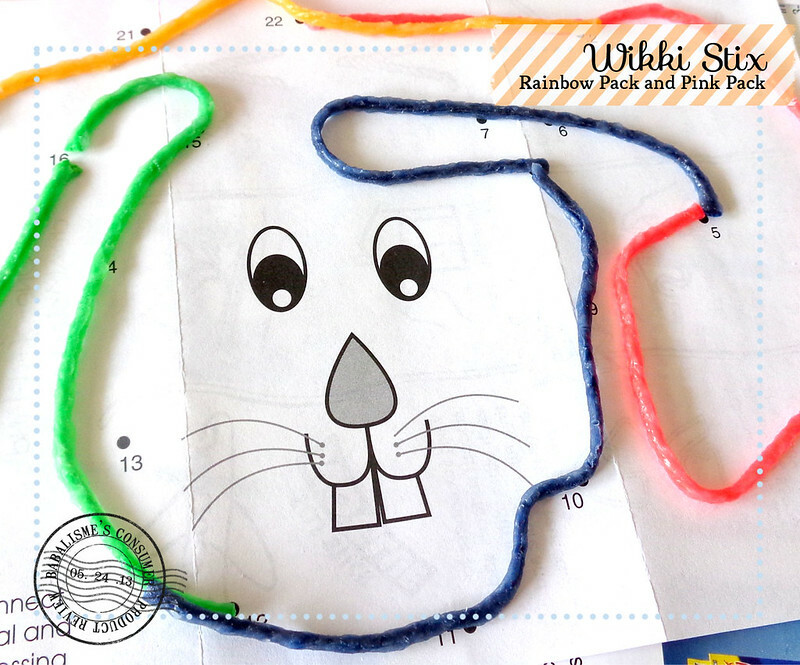 dot to dot activity with Wikki Stix! 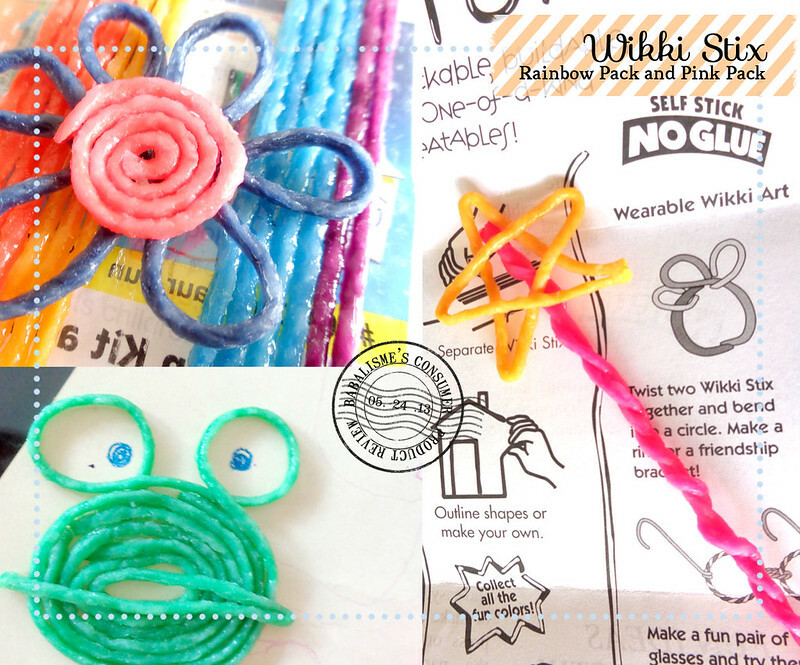 After playing with Wikki Stix, here are my (and Big Sis G's) verdict..
Glutten-free, non-toxic, food grade, odorless, mess free materials. It never dried up, you can use it over and over again. Fun, creative, and educational content. Big Sis G's own word : "I can make things with this spaghetti"
They are highly sticky and leave sticky, glue-y streaks upon glass surface, cleaning the surface needs some extra time. You can always lined your glass/wooden table with some coverings before you play though. Once you cut it to desired length, well, there goes your length. 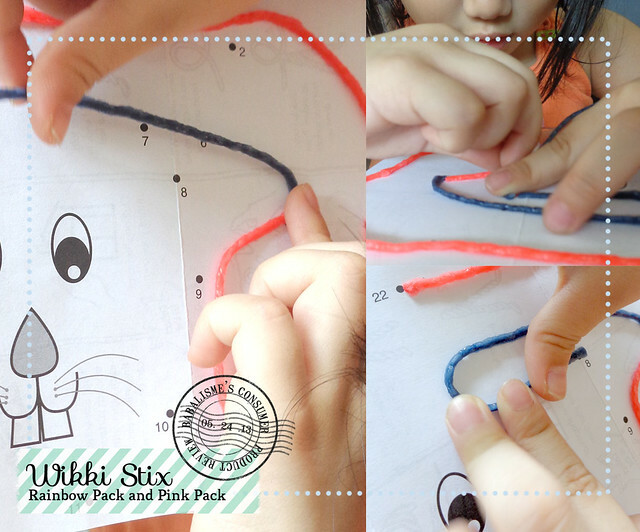 Wikki Stix can now be found all across South East Asia; Singapore, Malaysia, and Indonesia. Indonesians, in particular, can find Wikki Stix in Kinokuniya Bookstores all over Jakarta (Plaza Senayan, Pondok Indah Mall and Grand Indonesia). 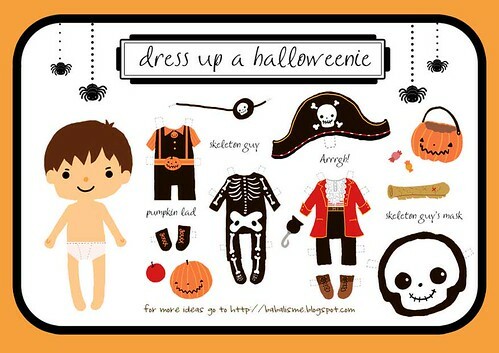 Price ranging from $6.30, lots of variety too, from single color packs, educational kits, themed/seasonal kits, to birthday sets, and if you shop online, they are offering free worldwide delivery! Sometimes I think Big Sis G, sooner or later, is going to take my throne is at the keyboard, and make babalisme her own. She's a natural fashion and beauty blogger, don't you think? It just a matter of time until she learns how to type and blog. I don't mind, though. In the meantime, here's a fashion blog post courtesy of my guest blogger of the moment, Miss G.
Thanks to sweet Briana (hey, visit her at SweetDreamsareMadeofThese), I am able to surprise Big Sis G with a pink kimono dress in pink by Le Petit Society! 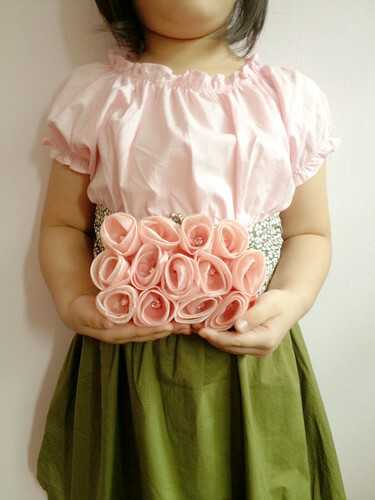 Le Petit Society is a baby to toddler wardrobe retailers based at Hong Kong. Psst, they are currently offering free shipping to the rest of Asia. Ahem. 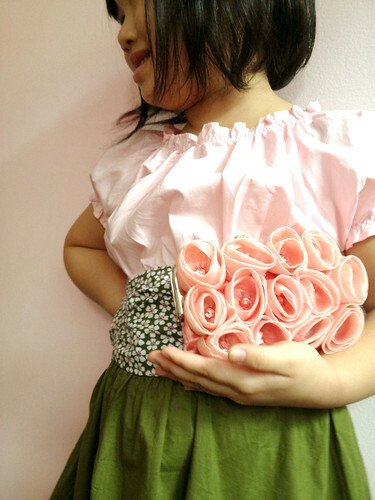 What's so great about Le Petit Society is their stock are designed by freelance mommy "slash" designer. I'm all so into supporting other freelancer moms! Team moms all the way! Bag : it's a gift from her Auntie. The kimono dress is retailed at HKD238.00. Get yours will supplies last! They are running out of bigger size! What do you think of today's guest blogger? She would love some inputs!